Summer in the City II features the community of Carson. Located 13 miles to the south of DTLA, Carson is home to California State University – Dominguez Hills, the StubHub Center, and that giant blimp that you sometimes see floating around the sky! It’s also where you can find our host for Summer in the City II – the Phantom Carriage Brewery. Join us down at Phantom Carriage to learn more about the beer business. APA Los Angeles has assembled a fantastic panel of guests (see below) for a lively, informal conversation about the success of the brewing industry in Los Angeles. Learn more about transitioning from home brewer to commercial brewery, what breweries are looking for when scouting a place to call home, the hurdles of getting a brewery up and running, and misconceptions about breweries vs. clubs, bars, and nightclubs. Oh, and that question that none of us can answer without smiling – why do we love sitting a brewery and drinking beer so damn much? Doors open at 11:00 a.m. Panel discussion begins at 11:15. After our chat, Phantom Carriage will be offering up tours of the brewery – and maybe even a tasting opportunity? APA Los Angeles will provide snacks, but feel free to stay later into the afternoon for beers, food, and networking with other attendees. Cheers! Parking/Transit Information: Parking is available at the brewery; street parking is also available. Take transit, bike, jump in a ride share vehicle, carpool with friends of colleagues, just be smart! Panel Members – keep checking back as this list gets fine tuned! Martin Svab – Martin’s a self-proclaimed beer geek and one of the founders of the Phantom Carriage Brewery. After a favorable reception for their first small-batch beer, the partners sought out a local space to house the brewery. Carson welcomed the team with open arms, and a comparatively streamlined bureaucracy. The 7,000-square-foot location now houses a tasting room, a small pilot-batch brewhouse, a screening room for classic horror films and beer education classes, and a kitchen focused on sandwiches and small plates. Frances Lopez – Frances is the Executive Director of the Los Angeles Brewers Guild, a non-profit organization comprised of over 45 independently-owned craft breweries within L.A. County. 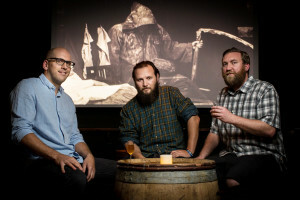 Its mission is to promote, protect, and foster a world-class beer culture in L.A.